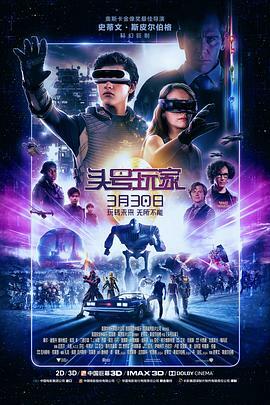 《头号玩家》经典台词截图：这是“绿洲”世界，在这里唯一限制你的是你自己的想象力。This is the "oasis" world, where the only limit is your own imagination. 《头号玩家》经典台词截图：大家来到绿洲是因为可以做各种事，但是他们沉沦于此是为了不一样的人生。People come to the oasis because they can do all kinds of things, but they sink down in this way for a different life. 《头号玩家》经典台词截图：我现在跟你们说这些，是因为未来陷入了危机。I'm telling you this now because the future is in crisis. 《头号玩家》经典台词截图：我来这里是为了逃避现实，但我发现了远比自己更重要的东西，我交到了许多朋友，我找到了真爱。I came here to escape from reality, but I found something far more important than myself, and I made a lot of friends, and I found love. 《头号玩家》经典台词截图：现在有很多人已经失去了生命，这是一场控制未来的战争。There are many people who ha.ve lost their lives. It is a war to control the future. 《头号玩家》经典台词截图：找到他，欢迎加入起义军。Find him. Welcome to the rebellion. 《头号玩家》经典台词截图：这不仅仅是一个游戏，我说的是现实世界中的生死。It's not just a game. I'm talking about life and death in the real world. 《头号玩家》经典台词截图：问问你自己，你愿意为此而战吗?Ask yourself, are you willing to fight for it? 《头号玩家》经典台词截图：谢谢你玩我的游戏。Thank you for playing my game.